Do not jump straight into live trading! Success with any trading strategy should follow a graduated implementation plan, to allow you to increase risk ONLY as you have proven sufficient knowledge and skill at each risk level. YTC PAT Vol 5 discusses deliberate practice and provides a detailed example of a graduated learning plan. 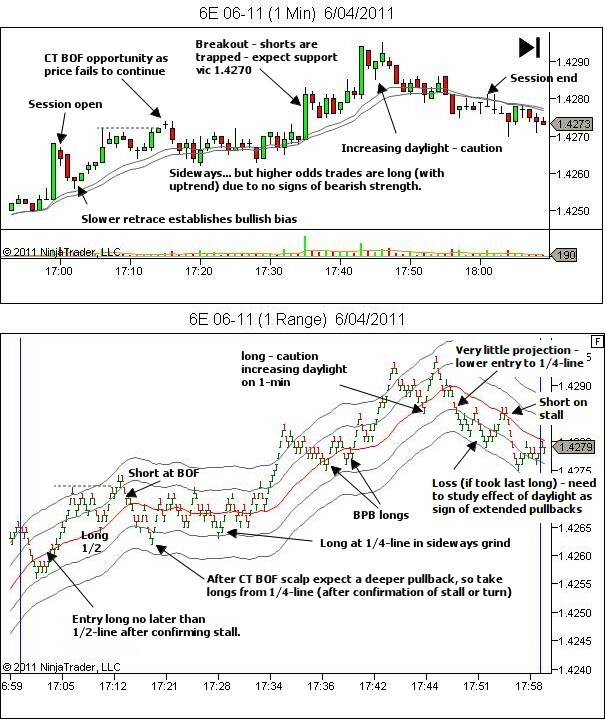 YTC Scalper offers a similar (but much summarised) version, which I will share with you here as an example. Consider implementing a similar plan for your own trading, adapting of course for your preferred market, timeframe, strategy, risk tolerance and financial situation. Implement a 20-session period of chart review. If you happen to have access to historical data that can provide 1-range price bars, then you can fast-track this stage. If not, you’ll need to do it in real-time. Note: Reviews are completed post-session, not live. This is a period in which you learn to see the scalping channel opportunity, with the benefit of hindsight. Your goal in this stage is to develop belief in the scalping channel. Learn to trust that if your bias for future channel-flow is correct, then the scalping channel offers significant opportunity to profit. Buy a folder for storing your post-session reviews. Start filling it with charts with hand written notes of hindsight based analysis. The following is an example of the kind of post-session review required to maximise learning. Implement a minimum 20-session period of simulator training with real-time data. Trade exactly as if you were doing this live. This includes effective application of your money management plan, as discussed in YTC PAT Vol 4. Treat this like a business. If you hit any of your session, weekly or monthly drawdown limits then STOP trading. Review your results; regroup and then either continue or start all over again. Implement your Trade-Record-Review-Improve process, as per YTC PAT Vol 5. Pick just one of the sessions per day and Trade. Review the session. Compare hindsight perfect trading with your own results. Replay key sequences. Print charts, add notes, and store in your session review folder. Building confidence in being able to manage a position, in order to minimise risk and maximise opportunity. With every second of deliberate practice, you are improving your intuitive ability to perceive and react to shifting signs of strength or weakness within the price action. At the end of 20-sessions, if you are not profitable (after commissions and expenses), then continue with this stage of learning. Continue tracking your stats for a rolling 20-session period. When you get profitable, and stay there for 5-sessions, advance to the live market. As for the simulation stage, but this time the process is repeated in the live market with the minimum position size available (2-part positions). If you cannot afford this then remain on the simulator until you can afford it. Continue adding to your session-review folder. And continue with other YTC PAT Vol 5 tools for deliberate practice. Again… at any stage if you hit any of your session, weekly or monthly drawdown limits then STOP trading. Review your results. Consider whether you need to drop back to the sim for another period of time. Otherwise continue. Track your stats for a rolling 20-session period! Only ever consider a size increase if (a) your stats show a profit for the last 20-sessions and (b) your account balance allows an increase, such that maximum position risk per trade will still be less than or equal to 1%. For each size increase, monitor the first 20-sessions carefully. And again… at any stage if you hit any of your session, weekly or monthly drawdown limits then STOP trading. Review your results. Consider whether you need to drop back to the sim or a smaller position size for another period of time. Otherwise, continue. Most important of all… stop the size increases if it’s going to lead to position risk greater than 1% of account. Your goal in this stage is for gradual increase of risk only as you prove capable of managing each level.